Launching Symbian-smartphones has always been some kind of an event for Sony Ericsson, since these products became leaders of the line and at the same time best products in their classes. And often they had no copies when speaking about a touchscreen for Symbian devices especially, let alone other functions. 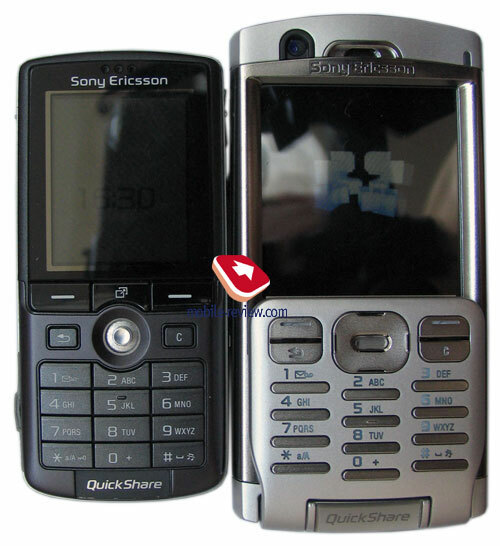 The release of Sony Ericsson P800 being the first model of the line in the middle of 2002 was significant, then it was renewed in the person of the Р900, which brought no principal changes, however was a step forward in design of such products. In 2004 the Р910 became a slight breakthrough, it provided the same design, but a better function set and another screen (by the way, physically the screens are interchangeable with the P900). Till today Symbian-smartphones by Sony Ericsson were a standard for the maximum set of functions, functionality and outstripped the time. The gap between the rivals and the company reduced with each new model, they introduced smartphones competing with the company's ones, and hence Sony Ericsson had to create its regular bestseller. Mass appearance of Windows devices with different names and equal inside became extra headache. And if in the beginning the market counted only a few devices and hence was mainly controlled by Sony Ericsson, then now it is principally impossible. The majority of the market is controlled by Nokia now, its Series 60 devices (own development, which is licensed to third companies) represent various solutions in many segments. And under such conditions, for the company of Sony Ericsson launching a bestseller with long life circle becomes vitally important. Now the company cannot release many various devices due to problems with production capacity and shortage of manpower. And due to the influence of the tails about Harry Potter the product got the name of Hermione. I received the first samples of the device about a year before its official announcement and they looked like pieces of plastic with functional peculiarities specified (the screen size, key disposition and so on). And soon it got clear, that not the hardware part of the phone, but its software filling will be the most constraint of the launch. 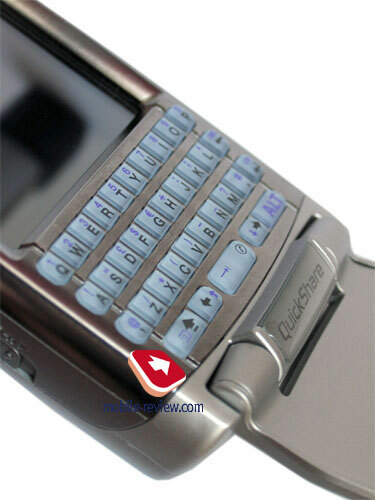 The specifications promised operating system Symbian v9.1 with UIQ 3.0. The silence was the answer to all the questions about how soon the UIQ 3.0 will be integrated into the current hardware, the Sony Ericsson engineers hoped by the end of summer 2005 they would receive working samples of the system and start the tests. As time showed, the UIQ 3.0 will be completed by January 2006, and the final tests of Sony Ericsson P990 (final validation) inside the company are set for this time. You shouldn't expect the device before the end of March if only the Sony Ericsson's managers test the UIQ 3.0 for our money, which is least probable. However, even now you can estimate the capabilities and perspectives of the device. Let's consider them in order. 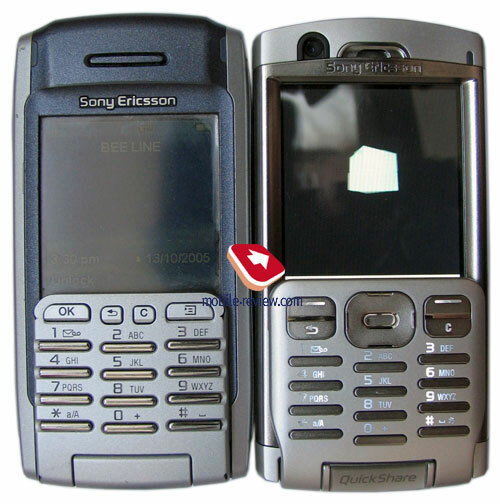 The designers tried to keep the look of Sony Ericsson P900/P910 and make it as rememberable. The difference in the body size is not very big, since this phone has the dimensions of 114x57x25 mm and the P900, for instance, is 117x57x27 mm in size. At the same time the absence of colour changes makes the model look thicker, now it is only in silvery. Using the device raises the same feelings as the previous smartphones, no unexpectedness. However, you should better carry it on your waist in a case or in a pocket of your jacket. In a shirt or in a trousers pocket the device seems rather inappropriate. 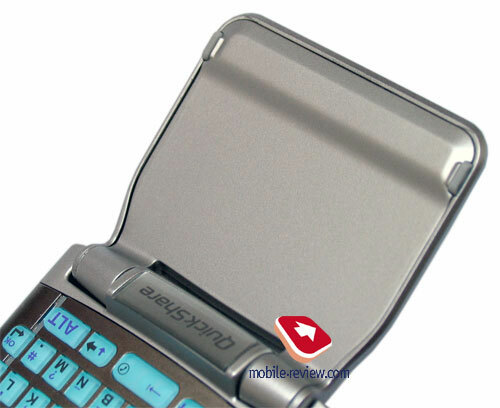 The developers returned to the weight of the first representatives of the line, and namely Sony Ericsson P800, thus the P990 weighs 155 g (with a flip). The explanation of the grown weight is hidden not only in more functions added (for instance, Wi-Fi), but in a metallic edging around the screen. 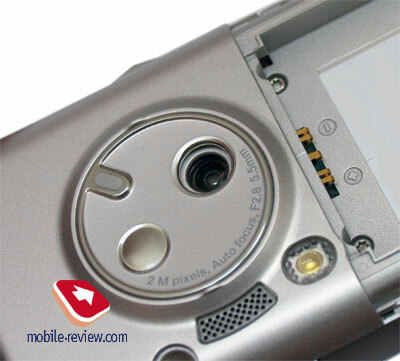 Users of Sony Ericsson P900/P910 could have faced a problem when the rubber insertions on the flip, protecting from strong blow at closing, in the end broke the body, and the plastic started crumbling. That caused no special problem, however spoiled the appearance of the device (certainly, when open), also broke the feeling of reliability. In my case Sony Ericsson P900 was damaged this way after a year of use. 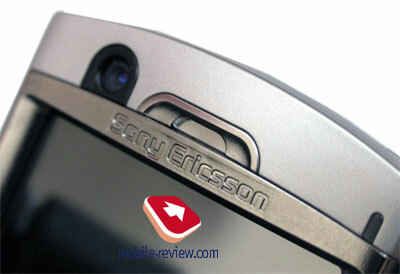 Sony Ericsson P990 uses a metallic edging around the screen, and thus any problems with the flip influence are excluded. Here Sony Ericsson's engineers decided to reduce the number of appeals in service centers. Another curious thing is evidently the colour is also dictated by correcting mistakes. Monochrome plastic is less liable to abrasion, and the base will show not as soon (and again, a year of daily intensive use). The appearance is influenced by the need to integrate various components into a small body. I think the design can't be called stylish. 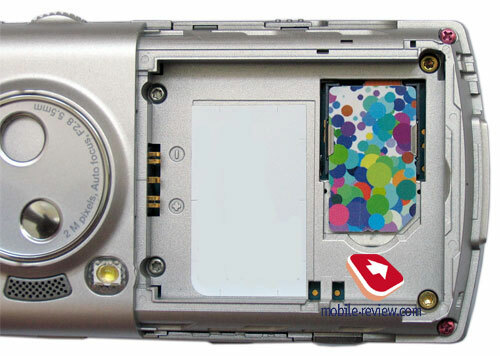 The cameraphone concept dictated the back panel resembling a digital camera. 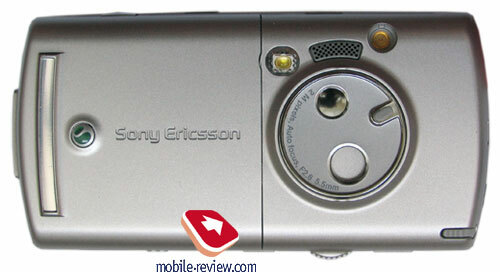 And the designers not bothering much took the idea of Sony Ericsson K600i. A similar shutter closing the objective, and the same disposition of other elements. The front panel looks absurdly due to the frontal camera on the top and small distance from the screen edge to the top edge of the phone. The dark deepened into the body screen makes a feeling of volume strengthened by the projecting flip. And by the way, putting the device on an even surface with the screen down, we noticed it was not balanced due to a very projecting flip. 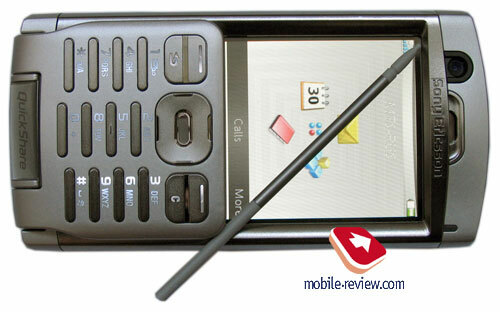 However tastes differ and some of you will like the design of Sony Ericsson P990. As for me, the appearance is a mix of images, an attempt to create a business device, stress the presence of a camera and squeeze extra functions into the same volume. Just a medley. And that is the way Sony Ericsson P990 looks, and feels. 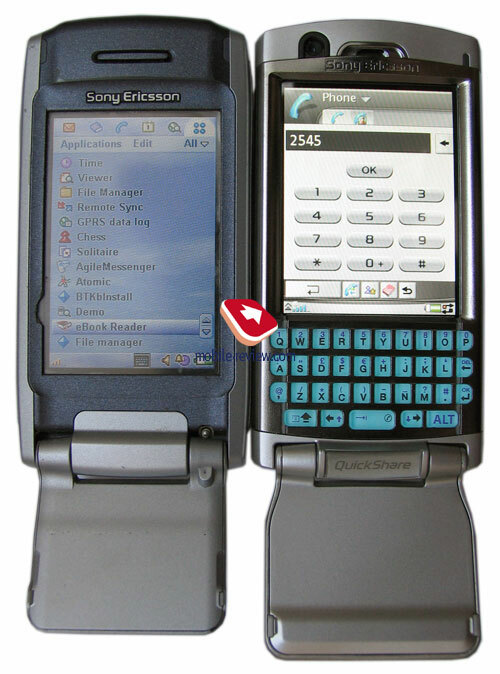 The designers failed keeping on the Sony Ericsson P900/P910 line successfully. Now finishing the talk about the design, I'd like to note it is bearable, not more. Separate elements look perfect, but do not look effective altogether. Anyway, one should see the device live, not a single picture can tell the feeling of the change of colour and volume. 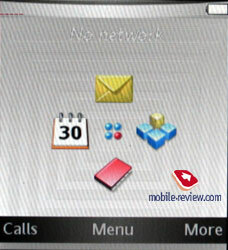 Speaking about the esthetics of such models, probably, we should remember the example of Nokia N70, which is now one of the most thought over candybar, keeping the style and the contents. 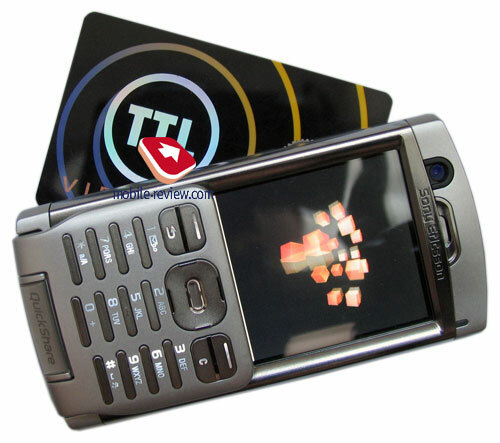 Besides the design, refusing a company feature like JogDial really disappoints, it has become a visit card of Sony Ericsson's smartphones. To describe the general situation, the JogDial remained, but it became 3D and not 5D as before. The difference is felt in the first minutes of dealing with the phone, then irritation grows and the only thing you want is to turn it all back. Now, as the developers considered, the JogDial serves for scrolling lists and selecting this or that item. They though that pop-up context menus are an excessive luxury, and if you want to use all functions, then unfold the flip and use a stylus or a keypad. Understanding that you will need to return to the previous menu level, they put a Back button on the same side surface but lower. That is instead of a 5D JogDial we got its 3D version and a stand alone button. This change is obviously unequal. The fact the button is deeply dunk into the body also disappoints, it is hard to press. Now working with one hand it much worse, advanced users are shortened in capabilities. 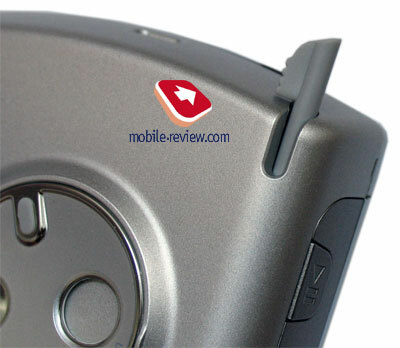 A Music Button responsible for activating either a radio or MP3 player is on the very same side surface, this is equal to Sony Ericsson K750i. Below you see a toddler locking the keypad in the standby mode or a flash in the camera mode. Such a toddler first appeared in Sony Ericsson S700 are proved its best. The right side features a Memory Stick slot. The company announced support for 4GB memory cards simultaneously with Sony Ericsson P990. The cards will appear on the market in the course of half a year. When about a year ago your obedient servant wrote about card of such capacity, many "informed" readers used to prove they did not exist and never would, time judged between us. A slight hint, the card line can cloudlessly develop to 16 GB, and no sense is seen in furthering. 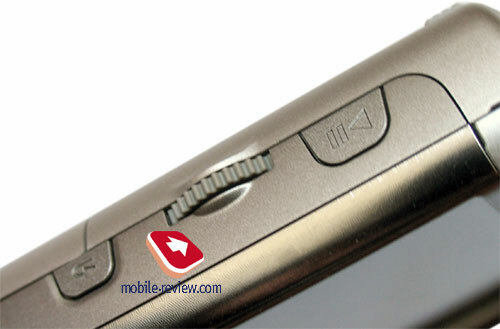 This very side features a camera button, which is shifted down, since you should take photos in album mode (landscape). A browser button is on the top, in system settings you are allowed to change the function to the one you like. One more unpleasant point is the P990 has no standard headphone output onboard. Now the headset is connected only via a system Fast Port connector, which adds about one cm to the total height of the device. Extra inconvenience is a case can have no hole for the connector. The explanation is the company wants to promote Bluetooth-stereoheadphones with Sony Ericsson P990 and Sony Ericsson W900i (Sakura). For the moment, none of these devices undergone Bluetooth certification, however, we can say they are compatible with protocol version 2, also support sound transmission to external devices, and corresponding menu items are present in musical players. Now let's return to the front panel. A frontal camera for videocalls is on the top to the left, and a system indicator is to the right. 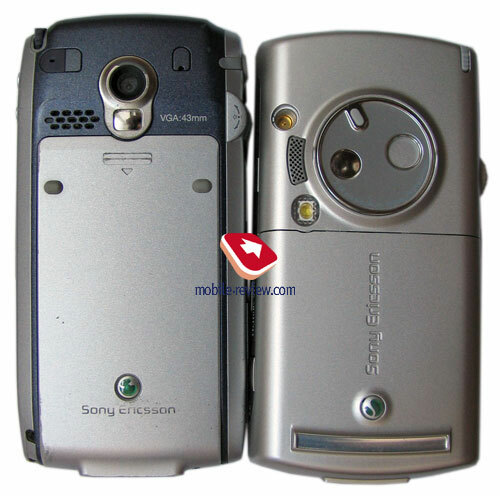 I think that the flip much told about earlier greatly resembles the one for Sony Ericsson P900. These flips are thin and not as comfortable I work as Sony Ericsson P910's. Uneven white backlighting lights up the right row more intensively. However, the characters are seen clearly near the keys. The joystick in the center prevents users with large hands from working comfortably, and an Ok button inscribed into it is too small. 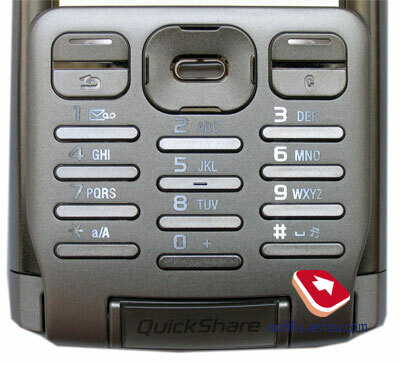 At the same time in the majority of cases this button can be replaced with the left soft-key, which makes dealing with the phone more comfortable. Now let's pass to the screen. This is the first time the company applied a QVGA display for a smartphone, thus the resolution is 240x320 pixels. The visible area of the screen with the flip forms 240x256 pixels. For you to compare, the majority of smartphones on the market has the resolution of 176x220 pixels, and a part of them are QVGA and only a series of Nokia's products has a higher resolution (for instance, the N90). The common resolution for such devices will be QVGA in 2005, and thus the P990 won't break out of the line. Comparing with the P910 we can say the screen diagonal reduced slightly and now forms 2.76" (against 2.8" in the previous version). It's not hard to guess the dot size reduced, and now the picture became brighter and readable. The 262K colour rendering in not nominal here, the pictures are bright and vivid. The screen quality and interface drawing lifts the model higher than the majority of smartphones and puts on the level with Nokia N90. The latter rather wins in small things (higher screen resolution tells upon). In the sun the screen behaves perfectly, the picture is seen well and this parameter is comparable to Siemens phones. Unpleasant point is the screen is deepened much and catchlights, often you have to find a necessary angle for comfortable reading. Finishing with the screen, Id' like to say it will suit the majority of customers. And I completely forgot to mention the thing that distinguishes the P990 from Symbian smartphones - the screen is sensory. 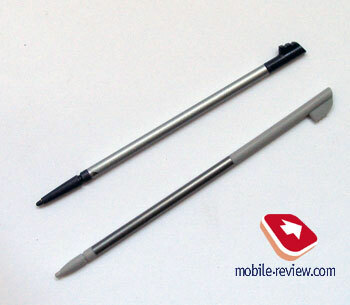 A stylus gap is in the left top corner. It is similar to the one of the P900 but is slightly higher. No peculiarities in disposition are observed, you will soon get used to the disposition. 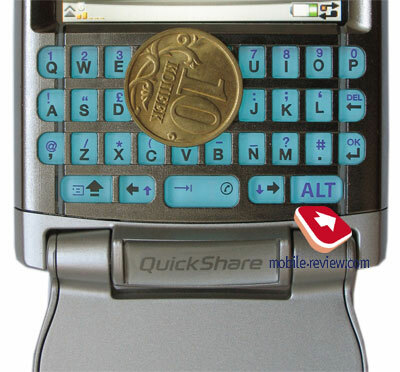 When the flip is unfold, a QWERTY-keypad is seen under the screen (you can remove the flip at all). 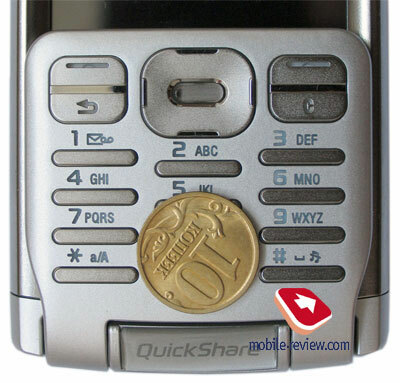 The buttons are small, however, larger than the ones on a folding flip of the P910. Working with the keypad is more comfortable with two hands; it will be hard using one hand. The key backlighting is blue and well seen under various conditions. The keys are average in comfort; it is obviously higher than for the P910, but worse than with wider devices. 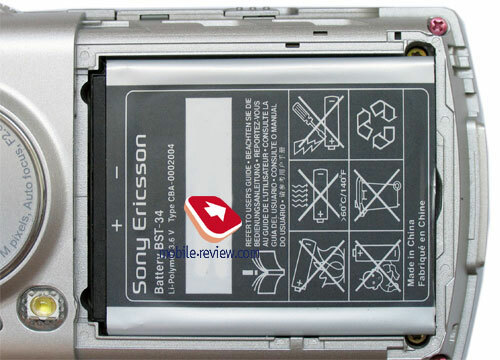 The localization will be carried out in the style of Sony Ericsson P910i. That means each market will have only one keypad layout available - wither Latin characters or local alphabet (totally three additional variants are available - QWERTZ, AZERTY). The presence of a QWERTY-keypad roused vivid discussions, some people agreed with this solution and others were against due to no need in it. I think such a keypad is necessary very seldom, and can be successfully replaced with a virtual one. And even more, specially for the P990 the developers made it possible to connect external Bluetooth headsets, which makes the presence of the integrated keypad even more dubious. This solution is in the spirit of today fashion, but not well-taken for the majority of the audience. The developers, and to be correct, specialists in marketing, wanted to integrate all possible devices and technologies. And we all know that hybrid devices are not very popular and take a niche position. And in contrast to this opinion Sony Ericsson decided on making an All-In-One smartphone to compete with all devices at once. 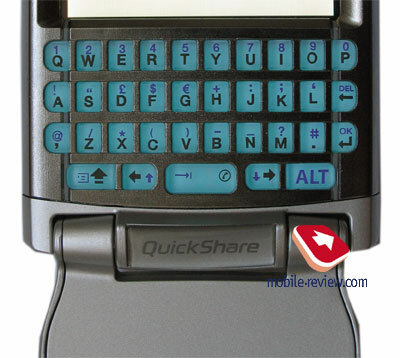 Short term effect may be reached, however, in half a year we can expect a version of the P990 without a QWERTY-keypad. This device will be about two cm shorter and will come closer to the K750 in height. The back cover has no evident backlash, and is removed very easily, just a slight move of your hand. 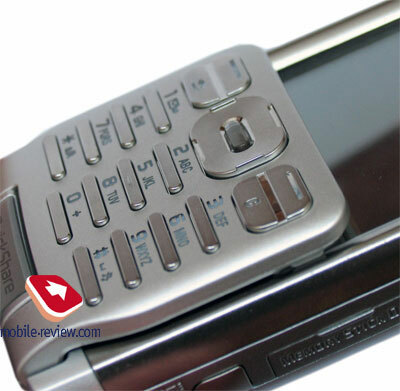 However, by the commercial launch the cover is promised to get very tight like in Sony Ericsson K750i. A battery compartment is placed under the battery. A new type of the battery is used called BST-34. This is a Li-Pol 1120 mAh battery. The manufacturer claims 400 hours in the standby mode and about 9 hours of talks. The battery life grows not because of some smarter energy saving technologies, but due to the annually growing coverage density in Europe. This allows greater numbers. In practice Sony Ericsson P990 showed not bad results, with only calls it lasted for about two days (an hour of talks). Using it fully you will have it lasting for a day (30 minutes of talks, Bluetooth on, 20 minutes of Wi-Fi, 10 photos taken, about 12 messages sent). So, you can count on one-two days of work. 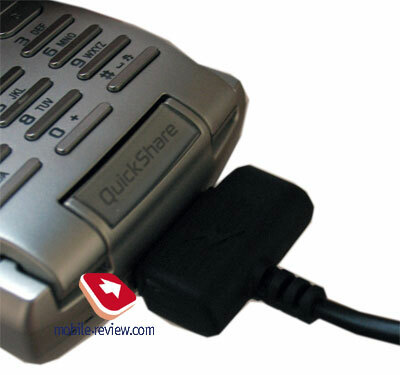 If you connect your P990 to a PC via USB cable, its working time will increase, since connected to a PC the device is recharged. A car charger will charge the battery completely in about 2 hours. The SIM-card fastening is standard and rouses no questions. In this part of the review we discussed the design and differences from the previous models. All the changes are quite serious and won't please Sony Ericsson's worshippers. For a newbie, they are not as principal and will seem quite successful (since such users didn't see other models). Even this part of the review shows that the result of a yearly of work of Sony Ericsson's engineers is ambiguous, and that means the model will rouse many discussions. The next part will tell about some advantages of the model, and there we'll tell about interface peculiarities, and new functions. 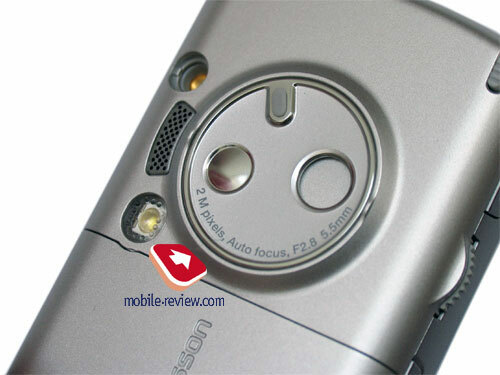 Due to the fact the 2MP camera is completely equal to Sony Ericsson K750i, we won't discuss it at all. You can see the pictures in a corresponding review, and our forum is rich in them also. My advice is not to make fats decisions about this product before examining the second part of the review.